Here’s a magical mid-afternoon doodle from mid-October…the height of the mushroom foraging season here on Vancouver Island. Pine mushrooms, golden chanterelles, gypsy mushrooms, Sweet Tooth mushrooms…all around the island, you’ll find edible fungi of all sorts ripe for the picking – if you’re into that sort of thing. Me…I prefer the bright red mushrooms that pop up under the wheels of my bike as I pedal around Oak Bay. Like this one. 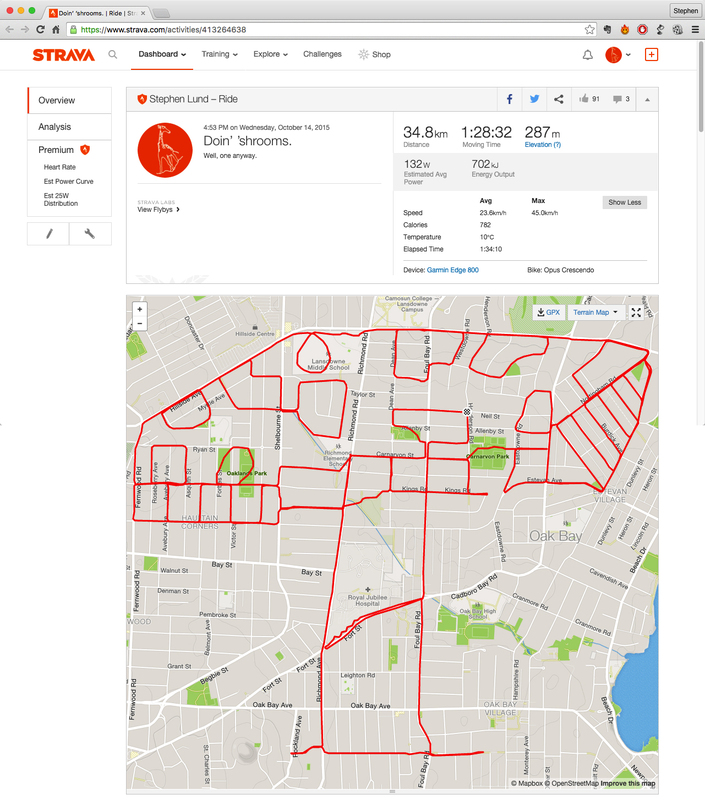 This entry was posted in gps art and tagged creativity, cycling, cyclist, garmin, gps, gps art, magic, mushroom, psychedelic, strava, strava art, victoria bc. Bookmark the permalink.